This was just something I whipped up on the spur of the moment for tonight’s dinner. There isn’t a recipe for this, since I vary the ingredients almost always … based on mood and what’s in the pantry. Fry a bunch of spices and aromatics in ghee. These can be: chopped garlic, shredded ginger or thinly sliced onions; a pinch of red pepper flakes or some crushed dried chiles, a few dried curry leaves and/or 1/2 tsp. black mustard seeds until fragrant. Add shelled shrimp that had a little salt sprinkled on it. Cook until shrimp are done. Stir in chopped heirloom tomatoes, add a squeeze of lime and garnish with cilantro. Eat. 02 Jun	This entry was published on June 2, 2012 at 9:46 pm. 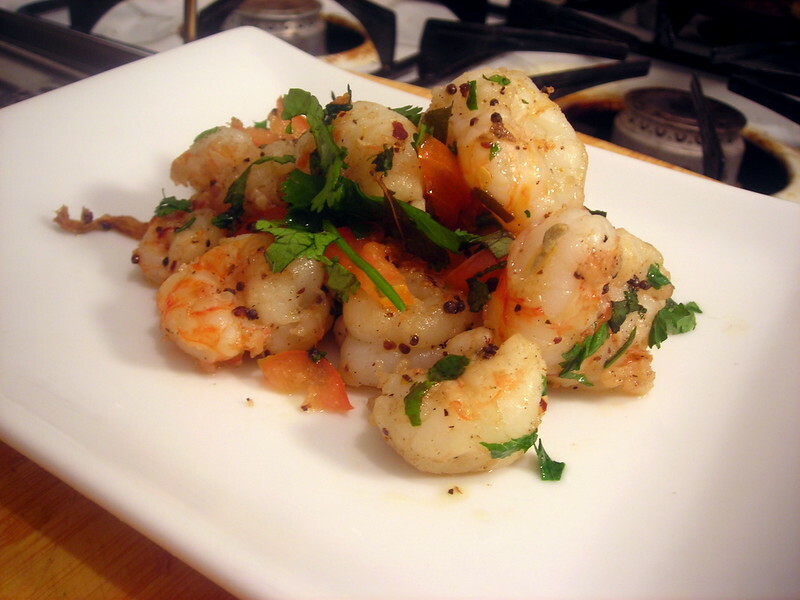 It’s filed under cooking, food, food photography, Indian food, summer and tagged appetizer, dinner, food photography, heirloom tomatoes, Indian food, shrimp, summer. Bookmark the permalink. Follow any comments here with the RSS feed for this post. This looks great, gotta try it. I cook like you do, using whatever is on hand.